Those awaiting results of August 2016 Guidance Counselor board exam can find here the full list of passers, top 10 (topnotchers), top performing schools and performance of schools as the Professional Regulation Commission (PRC) announced results in 3 working days after the last of exam. 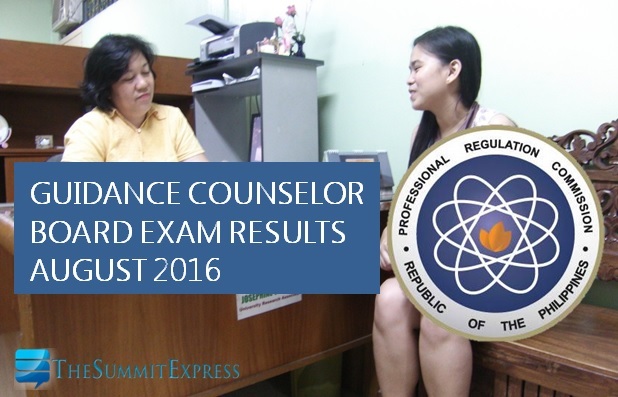 PRC on Tuesday, August 9, announced that 239 out of 390 passed the Guidance Counselor Licensure Examination. PRC and the Board of Guidance and Counseling administered the licensure exam on August 3 and 4 (Wednesday and Thursday) in the cities of Manila and Cagayan de Oro. The members of the Board of Guidance and Counseling are Dr. Luzviminda S. Guzman, Chairman (inhibited); Dr. Elena V. Morada, Officer-In-Charge; and Dr. Carmelita P. Pabiton, Member. The two-day exam covered the following major subjects: counseling theories, tools and techniques, career guidance and foundations of guidance (Day 1); and group process, psychological testing, organization, administration, and supervision of guidance services and program development (Day 2). According to PRC, the target date of results of the recent Guidance Counselor board exam is on Tuesday, August 9 or in 3 working days after the exam. In August 2015, results were announced by PRC in just 2 working days. A total of 252 out of 419 passed the Guidance Counselor Licensure Examination. Cebu Normal University (CNU) alumna Katrina Mae Alipoyo Uy topped the board with 89.45-percent average grade. The Summit Express will update this page immediately once the results are out online. Like us on Facebook, follow us on Twitter or subscribe to our e-mail list to receive exam-related updates.